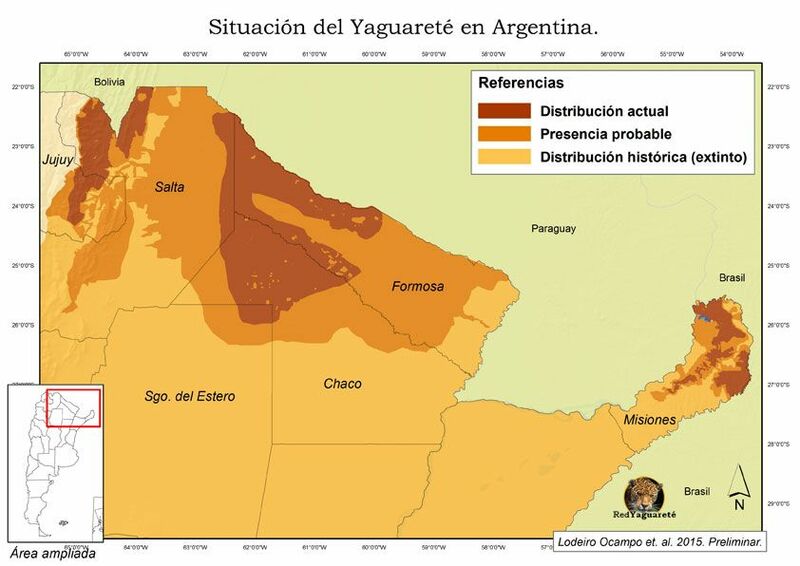 Jaguar (Panthera onca) presence in Argentina. The Jaguar is -after the pampas deer (Ozotoceros bezoarticus) – the large mammal that most territories lost in Argentina, more than 90% of its original distribution. By early 1900 still some individuals were in isolated regions of the humid pampas and by mid-century had disappeared almost to its current distribution, being killed at this time the last examples of Corrientes, Entre Rios and south of Misiones provinces. In recent decades its range has remained relatively stable, being due mainly to marginalization, remoteness from big cities and inaccessibility of their existing territories. However, in the last 10 years in the boundary areas of distribution, it has become increasingly rare and certainly with specimens in transit or longer isolated, as in the case of the Valle del Cuñá Piru, Colonia Andresito, San Pedro arroundings in Misiones, Metán ranges, La Caldera and El Rey National Park in Salta, Sierras Santa Barbara and Maiz Gordo in Jujuy, Humid Chaco and areas of the Chaco Salteño and Northeast of Santiago del Estero. All areas where records still occur, but as increasingly isolated and sporadic.